A woman lunged at police with a knife after officers were called out to an incident at her accommodation, Lincoln Crown Court was told. Sarah Easters had earlier self-harmed and then threatened staff members with a six-inch bladed knife at the supported housing unit where she was living. Phil Howes, prosecuting, said that staff at the unit on Skellingthorpe Road, Lincoln, were concerned both for the safety of themselves and Easters and as a result police were called. 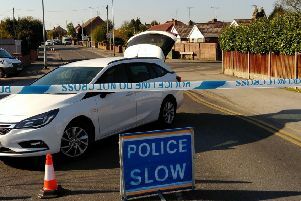 Mr Howes said “Three officers arrived and the staff opened the front door. “The defendant was in the sitting room armed with a knife. “It was held to her own throat. “The officers talked to her. They were concerned for her and their own safety. “She walked towards the officers and tried to close the door. “She lunged out towards one of the officers with the knife aiming at the officer’s chest. “The blade was six inches from his chest. Easters, 45, who is currently at a mental health unit in Northampton, admitted charges of possession of a bladed article and assault by beating as a result of the incident which happened on January 4, this year. Alan Birbeck, defender, said Easters had a history of mental health problems and spent three years in a hospital before being discharged to live at the unit in Lincoln. He told the court: “She was in a less structured environment. “It was thought she would be able to cope with that but she could not cope with the lesser level of supervision. “At the time of this incident she was off the medication she was supposed to be on. He said that after her arrest Easters was remanded to Peterborough Prison but following a number of incidents she was transferred to the unit at Northampton. Judge Michael Heath adjourned sentence to await a further psychiatric report.